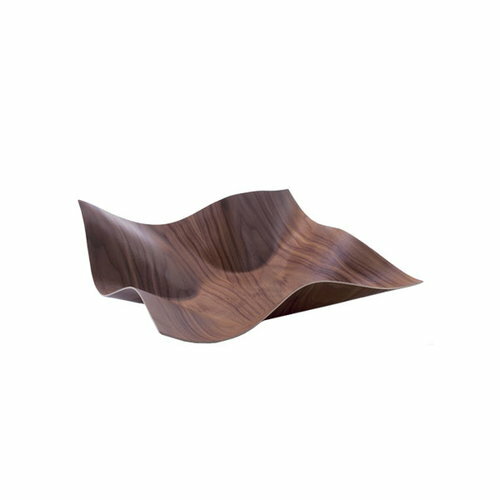 Tuisku bowl attracts the eye with their freely fluxuating forms. Tuisku is a Finnish word for a snowstorm and the bowl is like a snowdrift after a storm. Tuisku bowl was awarded with Design Plus prize straight after its launching in 2003. Petri Vainio (b. 1964) is a Finnish interior architect and designer. As a designer, one of his favourite materials is plywood and he studied veneer pressing techniques while studying at the University of Crafts and Design Helsinki. One of the results is the Tuisku bowl from thin birch, walnut or cherry tree plywood that is pressed into plastic forms. Tuisku is the Finnish word for snowstorm and the beautiful Tuisku bowls truly resemble the free floating snowdrifts after a storm. The Tuisku bowl was launched in 2003 and has since then been extremely popular, being awarded also with the Design Plus Award. Petri Vainio has also designed elegant lamps such as the Vuolle pendant lamp and the Helmat floor lamp. The shade part of Vuolle and of Helmat lamps is a free hanging textile spiral, which gives a softly diffused light to the surrounding. Vuolle and Helmat were chosen to represent Finnish design in the Finnish Pavilion at the Shanghai World Expo 2010.